While Christmas in July isn't hugely popular here in Oz, I love seeing the return of the cult favourite Snow Fairy Shower Gel. It's such a popular scent that you'll see people buy multiple bottles to last them for 6 months or more! My four year old was with me when I received the Lush package and her eyes lit up when she smelt Snow Fairy. * She said it smells like lollies, which is why it's so popular. It's a gorgeous scent for anyone who loves sweet smells. They have Rose Jam* available again. This 100g one is from their Mother's Day promo, but isn't available for sale (only the medium and large size is available). Rose Jam is a sweet and floral scented shower gel. It contains Goji Berry juice, lemon, rose oil and rose absolute. Another shower gel released is Snow White. This is based on their Christmas So White Bath Bomb. I haven't smelt the shower gel, but have used the bath bomb previously and it was beautiful. It contains fresh apple infusion, sweet orange oil and bergamot. Snow Fairy, Rose Jam and So White come in 2 sizes. 250g for $17.50 or the large 500g bottle for $29.95. 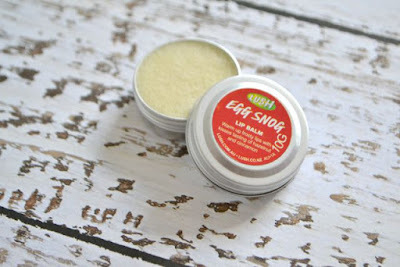 I also received their Egg Snog Lip Balm. * It's a classic Christmas smell. It contains vanilla absolute, hazelnut and walnut oil, cocoa, shea and murumuru butter as well as lemon oil. It smells amazing, but is also really lovely and moisturising. I'm not a huge fan of pot lip balms so I apply this with either my Rae Morris Lip Brush or a clean cotton tip. I would love to see Lush release their lip balms in a stick form. Egg Snog is only $9.95 each. They also have released 3 bath bombs, 2 bubble bars, 1 bath melt, 1 body lotion and a soap. The products are available now until 22nd July 2015. To see the other products that are available, click here. Love their Christmas collection! It's exciting having it back in store now, but I stocked up at Christmas, and don't have any room left! Haha I know what it's like!! You want to make sure that you stock up enough until next year and end up with so many products that you could hand some down to your future great grandchildren!